I just learned from my twin sister that the best gift she received this Christmas was a present she actually gave her husband--and has been wearing ever since! 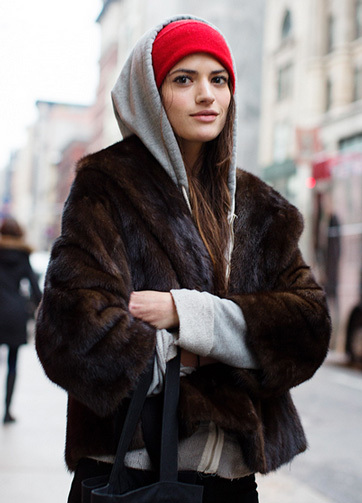 It's this cashmere J.Crew hoodie, which she's layering under warm winter jackets. The resulting look is undeniably cool and practical. Evidence here. Personally, I love how a hoodie--whether it's the cashmere variety or simply the old school sweatshirt kind--tempers a fancy fur, so much that I too will be buying myself this belated gift! I'm considering these options from James Perse, J.Crew, Topshop and Neiman Marcus (on sale). Any idea who makes the coat in the bottom pic?